Crafting is a wonderful activity to get into the spirit of the Christmas season. You can get really involved with your children and make wonderful decorations and presents. 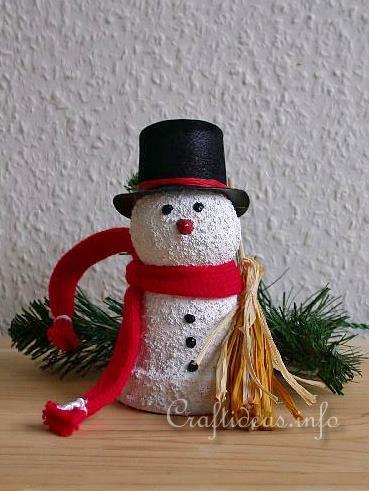 This snowman is a fun craft for children. It is easy and inexpensive to make and can be combined with other clay pot crafts shown on this website to make a set of decorations. Attention: Always use precaution while using a hot glue gun. Parents should be supervising children while gluing the pieces together. This project needs a bit of time due to the drying time of the paint and structure paste. 1. Paint the outside of the terracotta pot white and let it thoroughly dry. Do not paint the bottom of the pot. 2. Using the hot glue gun, attach the styrofoam ball on the pot and let the glue cool down. 3. Paint the textured snow paint over the head and pot and let it dry overnight. The drying time may take between 12 and 24 hours. 4. Cut a small band for the hat out of the red felt. Glue this onto the hat using the tacky glue. 5. Place glue on the inside cylinder of the hat with the hot glue gun and immediately place it onto the head and let the glue cool. 6. Cut a longer piece of the red tubing. Tie off the ends with white embroidery thread. Tie the tubing around the neck of the snowman. 7. Make a broom by bunching a bundle of raffia pieces together and binding them off at one end. Dip one end of the skewer into tacky glue and insert the skewer into the center of the bundle and let dry. 8. Attach the broom to the snowman with the hot glue gun. 9. Glue the red bead onto the face for the nose. 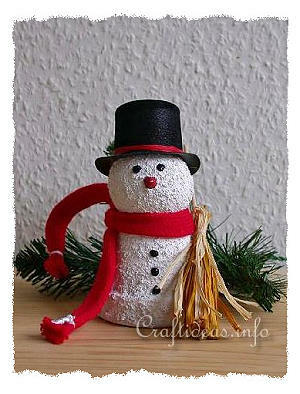 Use the dimensional paint to make eyes and buttons on the snowman. Make your own snow paste by mixing sand with white paint. Mix until the mixture is thick. Apply it with a small craft spatula and let it dry overnight.